You know those days where you wake up on the wrong side of the bed and then you’re out of conditioner? The ones where you step in a dirty puddle at the bus stop in open-toed shoes? And then you stare at your computer and your computer stares at you and neither of you can think of a single thing worth writing? Or you accidentally get a legitimate (and legitimately expensive) parking ticket? How about a fat day in a pencil skirt? Today the sky is blue and the sun is shining; it’s an iced coffee kind of day. I’ve got a new bottle of conditioner and my nails match my tank top, accidentally on purpose. Tomorrow I’m taking a trip east, to see my family and this band live and to eat some wedding shower cake. And according to my Astrology Zone forecast for the month of May, I’ve got the next 31 days on lock. So, there’s that. 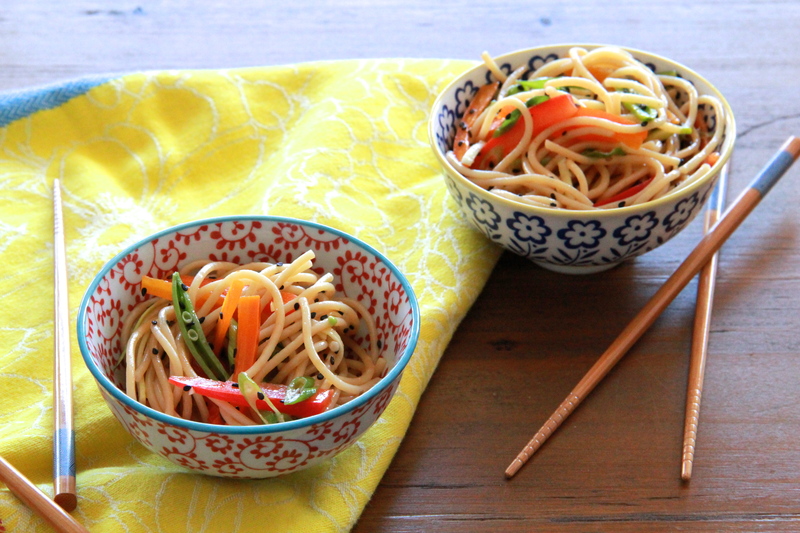 In this salad, our noodles are cool and slippery, rich with toasted sesame oil and Sriracha-style spicy. Thinly sliced fresh and verdant veggies keep things bright and crunchy. So many good things, to go along with all of the other good things. 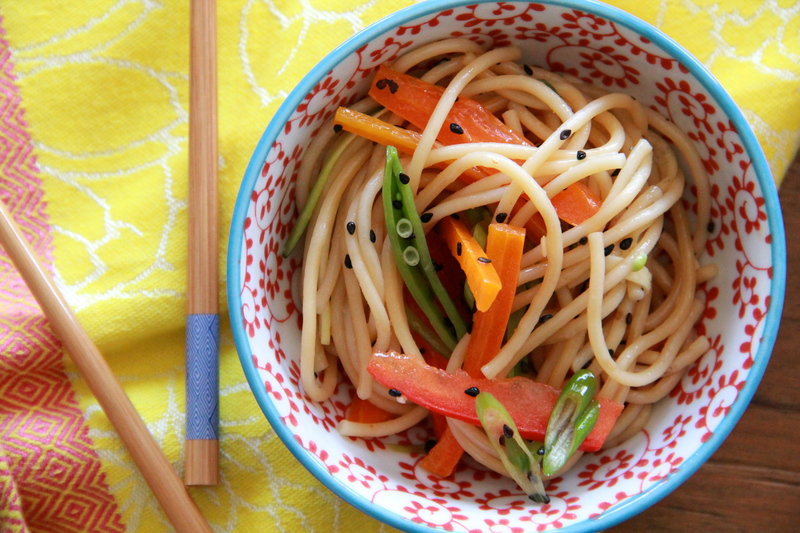 This month better watch out — because we are coming at it with noodle salad. And pink nails and general sass. But mostly noodles. If you can, make this salad the day before you want to eat it — it’s best after a night in the fridge, when all of the flavors have melded and married and matched up nicely. Alliteration and all that. 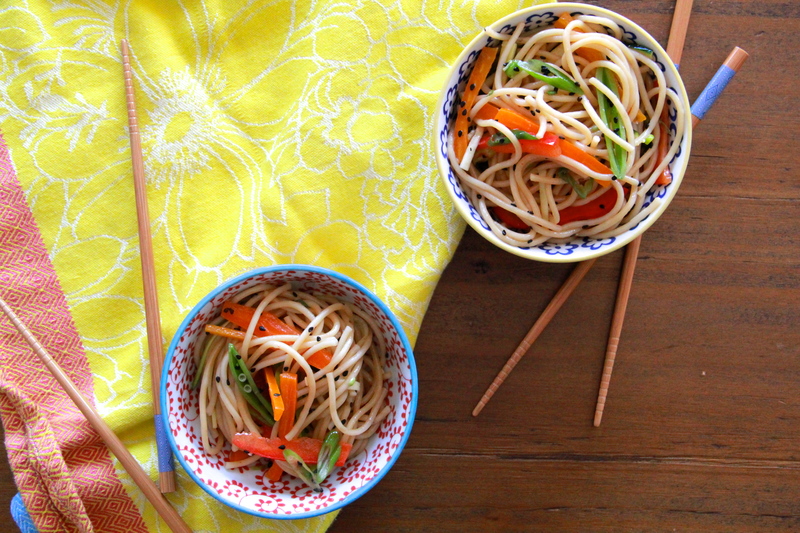 If you’d rather use soba noodles instead of plain old spaghetti, you are fancy and possibly also uppity but I support you. Cook spaghetti in a large pot of boiling salted water according to package and drain. While spaghetti cooks, chop your vegetables and combine them in a large bowl. In a small bowl, whisk together the oils, peanut butter, soy sauce, rice vinegar, lime juice and Sriracha — set dressing aside. 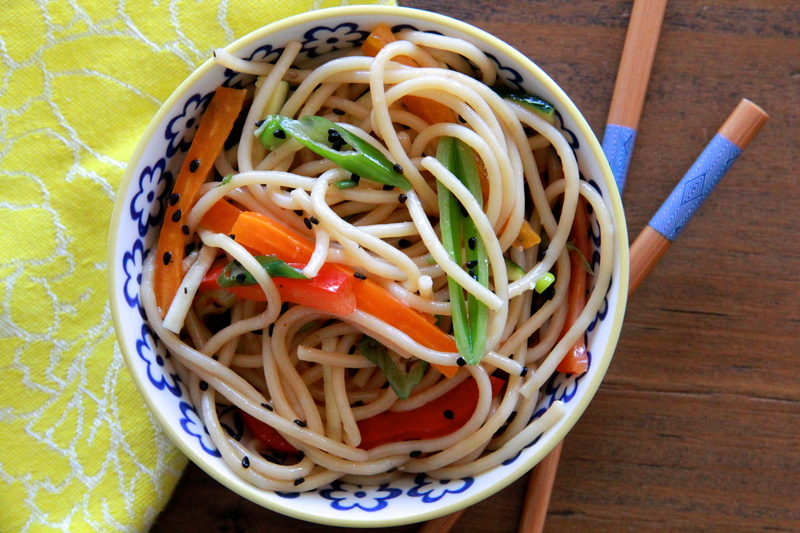 Once noodles are done and drained, pour them, still warm, on top of veggies. Pour dressing on top of it all, and toss to coat. Add sesame seeds and toss to combine. Cover well and chill salad in the fridge for a few hours (or, even better, overnight) before enjoying cold. call me fancy and uppity, but I’m going to try it with soba noodles ; ) your nails match your tank top, I call THAT fancy! love the post. I just made this for dinner for the second time. It’s such a simple but delicious dinner. Thanks! Yay! So glad you’re enjoying, Kara!